It’s the feastday of St. Clare! I’ll refer you to last year’s post on her, with links to biographical material and her letters, as well as photos from our own trip to Assisi. If you read nothing else, take a look at her letters, especially those to Agnes of Prague. 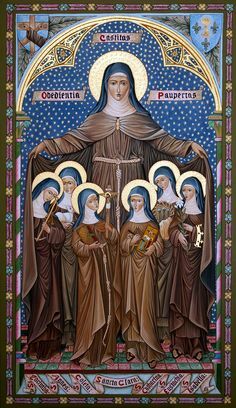 She entered the Poor Clares, and what makes the letters from Clare so interesting to me is the way that Clare plays on Agnes’ noble origins, using language and allusions that draw upon Agnes’ experience, but take her beyond it, as in this one. There are no photographs allowed inside the Basilica of S. Chiara in Assisi, which is where the original San Damiano cross is now kept. 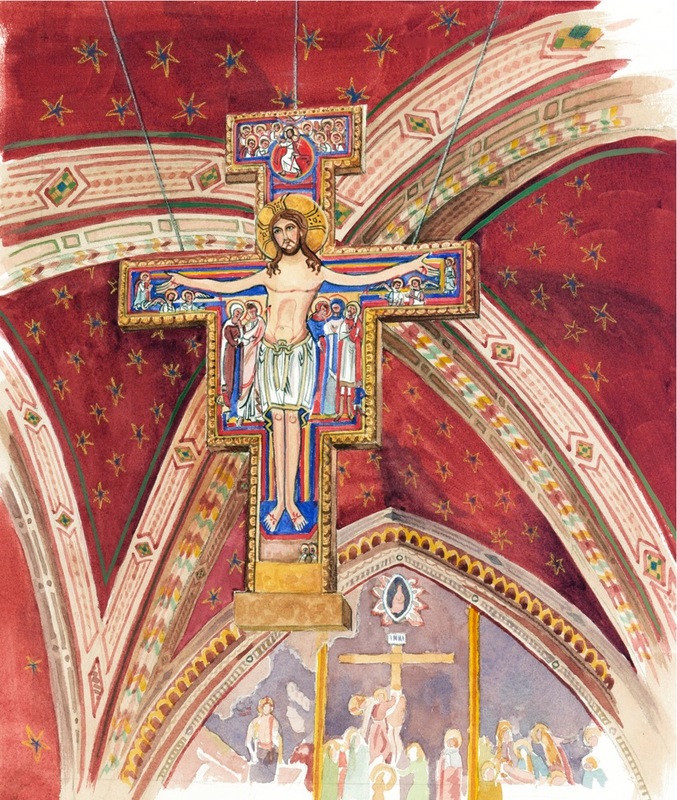 Here’s Ann Engelhart’s lovely painting of the San Damiano cross from Adventures in Assisi. So all I’ll say is that for me, my level of tension has decreased as the week as progressed. The fact that the new anti-texting-while-driving law took effect on 8/1 has helped. Not that I don’t see people still studying their phones on the road, but I’m hoping those numbers will, indeed, decrease and the risk to others decrease as well. Speaking of Alabama….this is for you, in case you need to be amused. I guess it’s basically the same crew that does SEC Shorts – I don’t care a wit about football, but I find any kind of subculture – including fandom – fascinating, and always enjoy some precision satire and observation. These are hit and miss, but when they’re on, they’re really funny. And the one on “southern” accents in movies…and bless your heart is okay, too. It’s just fun because they’re filmed in Birmingham, and the sights and sounds are familiar – there’s one about the challenge of eating healthy in the south that has a snip of the guy running in the park, distracted by an ice cream truck, which is very funny because he’s in Railroad Park where there’s always an ice cream song driving the world mad with its tunes…. This is a site to which I used to refer readers all the time: Aid to the Church in Need. It’s a good place to find projects to help and also provides helpful insight into the life of the Church around the world. Edited – I miscopied the template and have been skipping #5 – thanks for noticing!! Homeschooling is slowly getting rolling. We had a friend over on one day, and have had various other appointments, but next week looks clear. We’ve gotten going on math, and yesterday, he had his first good morning of “unschooling” – that is just reading and talking, and then recording what he’d read about. This won’t be a “comprehensive” education, but it will be…something. The Jungle: It was my older son’s summer reading, so I joined in…the fun. Well. On one level, it’s an “easy” read (for most of the book), because Sinclair was a journalist and tended to get right to the point and had great descriptive skills. It didn’t hurt that what he was describing was so vivid and visceral and the story of unrelenting misery so compelling, if…unrelenting. For those of you who don’t know, The Jungle was the fruit of a couple of months Sinclair spent in Chicago in the early 20th century, examining the meatpacking industry and the lives of the immigrant workers in that industry. The focus of the story is an extended Lithuanian family and the young man who marries into that family, named Jurgis. It’s all pretty devastating. The slaughterhouses and packing facilities are brutal and filthy. The workers’ lives are miserable and that misery is unrelenting. It’s all described quite vividly and, spoiler alert: No, things don’t get better. It’s just one thing after another. Sinclair has a point in this, though. He was a strong socialist, and while most people associated The Jungle with the story told about the industry and the resultant formation of the FDA as a result of the outcry raised by the book, Sinclair’s main intention was to raise sympathy for the workers. He was always a little distressed that the social activism inspired by the book was focused on the industry rather than the fundamental equation of American capitalism of the time – as he saw it – that made workers nothing more than cogs in a machine (or pigs on a killing line) for the purpose of enriching a relatively few. It’s a mostly interesting book – until the last sixth, or so, when Jurgis discovers socialism and does so mostly by listening to speeches. Speeches that we are privileged to share in, also. Page. After page. After page. Thousands of words of socialist uplift, Comrade. It’s important and interesting to encounter even that part of the book, in my mind, because of the spiritual associations. Jurgis experiences no less than a spiritual conversion that gives his life a transcendent meaning and binds him to others. As a whole, though, a book worth reading, even for young people. I quibble with a lot of school assignments, but I think this was a good choice as an introduction to the study, this year, of the second half of American history and literature. It vividly brings you into another world and lays out issues that gather up the promises of the first half of history that you studied last year then sets them in this new situation and demands you answer the question, What now? In 1956, blood spilled as Hungarians revolted against Soviet control. Hideg and his wife, a pianist, risked execution as they fled Budapest under cover of darkness. They sneaked past Russian infantry and escaped first to Austria and then New York City in early 1957. Hideg got a job as a janitor, and after work he’d race to Birdland and other Manhattan jazz clubs to see his heroes. In 1961, he and his wife loaded up their old DeSoto and headed west, flat broke, stopping at bars along the way to play for food and gas money, Hollywood or bust…. ….“I did not come to this country to be a burden on the state,” says Hideg, who has resisted signing up for many entitlements available to seniors. He chose the musician’s life, he says, and has no regrets. If he has a message for others, Hideg tells me, it’s that doing something you love will serve you well. And another thing: Don’t hesitate to ask friends for help if you need it. Louis Kabok, a local bass player who knew Hideg in Hungary, fled at about the same time. He says his friend’s high spirits in the face of hardship and advancing age don’t appear to be an act. Indeed, for all his troubles, Hideg glows. His silver hair is as thick as his Hungarian accent. His grin is young, timeless and broad, the grin of a man who’s in on a secret. Whatever day it is, the weekend is coming soon, and Hideg lives for Friday and Saturday. He can’t bang the skins in the quiet environs of his apartment building, so every Saturday, he stays drummer fit with a two-hour workout at Stein on Vine in Hollywood, the legendary music shop where he jams with gray-bearded buddies and it’s the 1950s all over again. The following will be rather mindless because I’ve just spend five hours at an academic competition (going on to nationals in June! Joy.) which stressed this introvert out, but I have work to finish up tomorrow morning, so I want to knock this out tonight…. Yes, I’ve been doing some work this week, and it’s kind of odd and refreshing because the work isn’t a Big Project. It’s a small project that I should be able to knock off in a few days, and I will, but one that still stretches me just a bit because it is, indeed, small. It’s more challenging to write succinctly and meaningfully than you might think. But it’s my favorite kind of challenge. The other project I’m working on involves seeing if a collection of talks from a conference can be shaped into a book. We’ll see…. Speaking of talks…I have one! Now that everyone is getting older, I’ve started accepting speaking invitations again..the next one will be an inservice/retreat thingy for Catholic school teachers a couple of hours away, and I’m looking forward to it. Also, Ann Engelhart and I will be speaking up on Long Island somewhere in early June…more on that when they finish up the PR materials. Tuesday night, I read the novel The Risen by Ron Rash. It was the most interesting-looking book on the “fiction new releases” shelf at the library. It was short – really, probably novella-length, and it was a good way to spend a couple of hours. The plot involved two brothers, and an incident that had happened almost fifty years before with a teenaged girl. I kept thinking of Rectify as I read, since a long-ago crime involving a teenage female victim is at the heart of that, too. The fundamental issue at hand was….how can we even try to compensate for the wrong that we have done? What is the relationship between the wrong things and the good that we do with our lives later? Does one cancel out the other – in either direction? A knotty problem, indeed. Artfully written, yes, and it certainly held my attention for a couple of hours and moved me a bit in the end, but at the same time there was a mannered aspect about it that ultimately left me cold. Well, not cold, but cooler than I feel I should have been left. Drifting about at the library the other day, I picked up a book of Maugham stories. Took it home, and read On the Internet that the one with the most startling titles, “The Hairless Mexican,” was considered one of Maugham’s best. So I read it, could see the “twist” about 2/3 of the way through, and then felt that the “twist” could have been handled much more subtly. As in…the hammer wasn’t necessary. So that was enough of that. This was on the “new releases” shelf, too, so I had to grab it. As of this writing, I’m only about 60 pages in, but am thoroughly enjoying it, and not just Because Rome. I read a lot of social history and history of pop culture, and so far, this is one of the best. One of the flaws of modern writing on these matters is the authorial voice is usually way too intrusive, presuming that the reason we’re reading this book is that we’re super interested in the author’s relationship to the subject matter, when honestly guys, we’re not. This is free of that narcissism, and is quite enjoyable and briskly, yet solidly written. Full report next week. Miss McKenzie! She found love! So exciting. Okay, not exciting. But a very satisfying read, even though none of her suitors, even the one she eventually accepted, were worthy of her. I’ve decided to immerse myself in Trollope for a time. What I find interesting and instructive is the forthrightness of the issues at hand – namely the restrictions and limitations in which the characters live, mostly financial in nature. We like to think that in our day, we make our choices freely, constrained only by our own lack of self-worth or society’s failure to accept us as we are. None of this in Trollope: your choices are limited, clearly, by how much money and property you have and by your gender. This is your life, as it is. What will you make of it? Very thought-provoking. Forgive me for repeating this Take from last week…but..it still pertains, don’t you think? The past two weeks, I’ve seen a spike in hits for this post – and I’m glad to see it. Also: tomorrow (February 11) is the celebration of Our Lady of Lourdes. Want to read more about Mary? 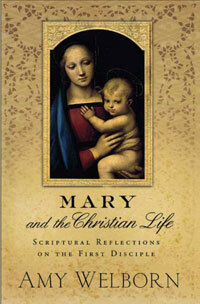 How about this free book – Mary and the Christian Life. And St. Bernadette? She’s in The Loyola Kids’ Book of Saints. Oh and…did you get the mass email from EWTN tying into…the Feast of the Immaculate Conception? Oops. What do we know about St. Clare of Assisi? As is the case with many historical figures, separating legend and history can be a challenge with Clare and the effort can even miss the point because…well, who knows? But it can be helpful and important to try to tease the two apart, not just for the sake of accuracy, but also so that we engage the willingness to be critical, not so much of the record that comes to us, but of our own assumptions. Are we, for example, molding the figure of St. Francis to a particular modern agenda by embracing some exaggerated legendary material about him but ignoring aspects of his life that are actually historically verifiable – his strict views on liturgy and reverence, for example? In his excellent and necessary biography of Francis, Fr. Augustine Thompson, O.P. 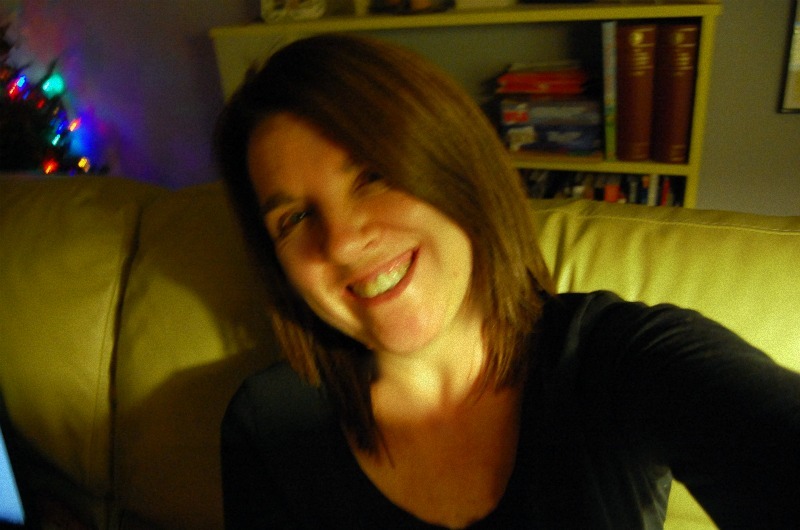 writes a bit about Clare, what we know about her and what is disputed. And from that point, until his death, we have no record of contact between Francis and Clare. When he died in 1226, his body was taken to the sisters at San Damiano for reverence. The letters of St. Clare to Agnes of Prague. Inasmuch as this vision is the splendour of eternal glory (Heb 1:3), the brilliance of eternal light and the mirror without blemish (Wis 7:26), look upon that mirror each day, O queen and spouse of Jesus Christ, and continually study your face within it, so that you may adorn yourself within and without with beautiful robes and cover yourself with the flowers and garments of all the virtues, as becomes the daughter and most chaste bride of the Most High King. Indeed, blessed poverty, holy humility, and ineffable charity are reflected in that mirror, as, with the grace of God, you can contemplate them throughout the entire mirror. Look at the parameters of this mirror, that is, the poverty of Him who was placed in a manger and wrapped in swaddling clothes. O marvellous humility, O astonishing poverty! The King of the angels, the Lord of heaven and earth, is laid in a manger! Then, at the surface of the mirror, dwell on the holy humility, the blessed poverty, the untold labours and burdens which He endured for the redemption of all mankind. Then, in the depths of this same mirror, contemplate the ineffable charity which led Him to suffer on the wood of the cross and die thereon the most shameful kind of death. Therefore, that Mirror, suspended on the wood of the cross, urged those who passed by to consider it, saying: “All you who pass by the way, look and see if there is any suffering like My suffering!” (Lam 1:2). Let us answer Him with one voice and spirit, as He said: Remembering this over and over leaves my soul downcast within me (Lam 3:20)! From this moment, then, O queen of our heavenly King, let yourself be inflamed more strongly with the fervour of charity! Such episodes, like other miracles whose memory lives on, prompted Pope Alexander IV to canonize her in 1255, only two years after her death, outlining her eulogy in the Bull on the Canonization of St Clare. In it we read: “How powerful was the illumination of this light and how strong the brightness of this source of light. Truly this light was kept hidden in the cloistered life; and outside them shone with gleaming rays; Clare in fact lay hidden, but her life was revealed to all. Clare was silent, but her fame was shouted out” (FF, 3284). And this is exactly how it was, dear friends: those who change the world for the better are holy, they transform it permanently, instilling in it the energies that only love inspired by the Gospel can elicit. The Saints are humanity’s great benefactors! St Clare’s spirituality, the synthesis of the holiness she proposed is summed up in the fourth letter she wrote to St Agnes of Prague. St Clare used an image very widespread in the Middle Ages that dates back to Patristic times: the mirror. And she invited her friend in Prague to reflect herself in that mirror of the perfection of every virtue which is the Lord himself. She wrote: “Happy, indeed, is the one permitted to share in this sacred banquet so as to be joined with all the feelings of her heart (to Christ) whose beauty all the blessed hosts of the Heavens unceasingly admire, whose affection moves, whose contemplation invigorates, whose generosity fills, whose sweetness replenishes, whose remembrance pleasantly brings light, whose fragrance will revive the dead, and whose glorious vision will bless all the citizens of the heavenly Jerusalem, because the vision of him is the splendour of everlasting glory, the radiance of everlasting light, and a mirror without tarnish. Look into this mirror every day, O Queen, spouse of Jesus Christ, and continually examine your face in it, so that in this way you may adorn yourself completely, inwardly and outwardly…. In this mirror shine blessed poverty, holy humility, and charity beyond words…” (Fourth Letter to Blessed Agnes of Prague, FF, 2901-2903). And then from a 2012 letter to the bishop of the area on the occasion of the anniversary of her conversion. According to St Clare’s Testament, even before receiving his other companions Francis prophesied the way that would be taken by his first spiritual daughter and her sisters. Indeed while he was restoring the Church of St Damian, where the Crucifix had spoken to him, he proclaimed that women would live in this place who would glorify God by the holy tenor of their life (cf. FF 2826; cf. Tommaso da Celano, Vita Seconda, 13: FF 599). The original Crucifix is now in the Basilica of St Clare. Christ’s large eyes which had fascinated Francis were to become Clare’s “mirror”. It is not by chance that the looking-glass would become a topic so dear to her that in her fourth letter to Agnes of Prague she would write: “Look into this mirror every day, O queen, spouse of Jesus Christ, and continually examine your face in it” (FF 2902). In the years in which she met Francis to learn from him about the way of God, Clare was an attractive young woman. The “Poverello” of Assisi showed her a loftier beauty that cannot be measured by the mirror of vanity but develops in a life of authentic love, following in the footsteps of the Crucified Christ. God is the true beauty! Clare’s heart was lit up with this splendour and it gave her the courage to let her hair be cut and to embark on a life of penance. For her, as for Francis, this decision was fraught with difficulty. Although some of her relatives understood her immediately — and Ortolana, her mother, and two of her sisters even followed her in the life she had chosen — others reacted violently. Her escape from home on the night between Palm Sunday and the Monday of Holy Week had something of an adventure about it. In the following days she was pursued to the places Francis had prepared for her but the attempts, even with force, to make her go back on her decision were in vain. Clare had prepared herself for this struggle. Moreover although Francis was her guide, several clues hint that she also received fatherly support from Bishop Guido. This would explain the prelate’s gesture in offering the palm to her, as if to bless her courageous decision. Without the bishop’s support it would have been difficult for Clare to follow the plan that Francis had devised and that she put into practice, both in her consecration in the Church of the Porziuncola in the presence of Francis and his friars, and in the hospitality she received in the days that followed at the Monastery of San Paolo delle Abbadesse and at the community of Sant’Angelo in Panzo, prior to her definitive arrival at St Damian. Clare’s story, like Francis’, thus has a specific ecclesial trait: an enlightened pastor and two children of the Church who entrust themselves to his discernment. In it institution and charism wondrously interact. Love and obedience to the Church, so marked in Franciscan-Clarissian spirituality, are rooted in this beautiful experience of the Christian community of Assisi, which not only gave birth to the faith of Francis and of his “little plant”, but also accompanied them, taking them by the hand on the path of holiness. Francis saw clearly the reason for suggesting to Clare that she run away from home at the beginning of Holy Week. The whole of Christian life — hence also the life of special consecration — is a fruit of the Paschal Mystery and of participation in Christ’s death and Resurrection. The themes of sadness and glory, interwoven in the Palm Sunday liturgy, will be developed in the successive days through the darkness of the Passion to the light of Easter. With her decision Clare relives this mystery. She receives the programme for it, as it were, on Palm Sunday. She then enters the drama of the Passion, forfeiting her hair and, with it, renouncing her whole self in order to be a bride of Christ in humility and poverty. Francis and his companions are now her family. Sisters were soon to come also from afar, but as in Francis’ case, the first new shoots were to sprout in Assisi. 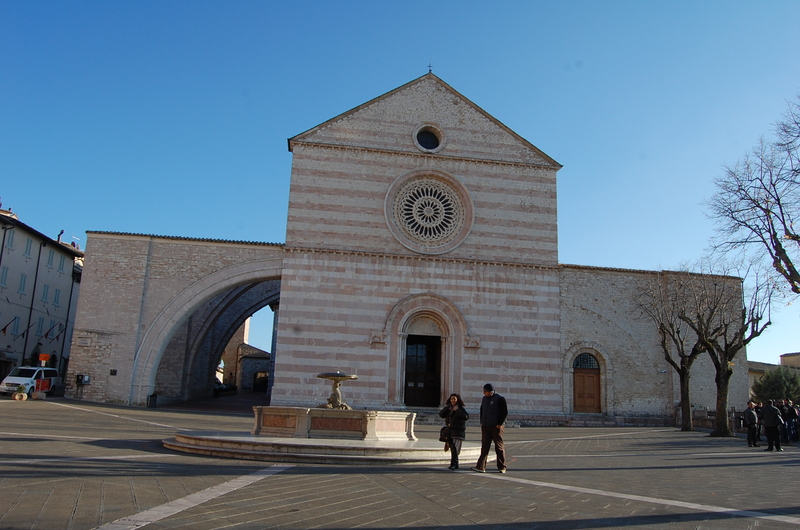 And Clare would always remain bound to her city, demonstrating her ties with it especially in certain difficult circumstances when her prayers saved Assisi from violence and devastation. She said to her sisters at the time: “We have received many things from this city every day dear daughters; it would be quite wicked if we were not to do our utmost to help it now in this time of need” (cf. Legenda Sanctae Clarae Virginis 23: FF 3203). The profound meaning of Clare’s “conversion” is a conversion to love. She was no longer to wear the fine clothes worn by the Assisi nobility but rather the elegance of a soul that expends itself in the praise of God and in the gift of self. In the small space of the Monastery of St Damian, at the school of Jesus, contemplated with spousal affection in the Eucharist, day by day the features developed of a community governed by love of God and by prayer, by caring for others and by service. In this context of profound faith and great humanity Clare became a sure interpreter of the Franciscan ideal, imploring the “privilege” of poverty, namely, the renunciation of goods, possessed even only as a community, which for a long time perplexed the Supreme Pontiff himself, even though, in the end, he surrendered to the heroism of her holiness. How could one fail to hold up Clare, like Francis, to the youth of today? The time that separates us from the events of both these Saints has in no way diminished their magnetism. On the contrary, their timeliness in comparison with the illusions and delusions that all too often mark the condition of young people today. Never before has a time inspired so many dreams among the young, with the thousands of attractions of a life in which everything seems possible and licit. Yet, how much discontent there is, how often does the pursuit of happiness and fulfilment end by unfolding paths that lead to artificial paradises, such as those of drugs and unrestrained sensuality! The current situation with the difficulty of finding dignified employment and forming a happy and united family makes clouds loom on the horizon. However there are many young people, in our day too, who accept the invitation to entrust themselves to Christ and to face life’s journey with courage, responsibility and hope and even opt to leave everything to follow him in total service to him and to their brethren. The story of Clare, with that of Francis, is an invitation to reflect on the meaning of life and to seek the secret of true joy in God. It is a concrete proof that those who do the Lord’s will and trust in him alone lose nothing; on the contrary they find the true treasure that can give meaning to all things. 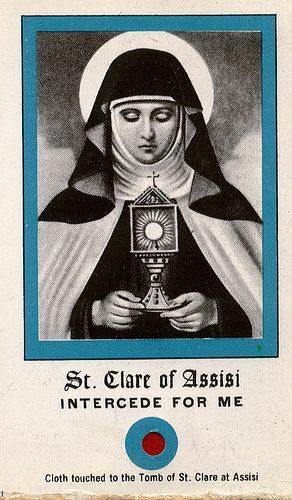 Due to a type of iconography which has been very popular since the 17th century, Clare is often depicted holding a monstrance. This gesture recalls, although in a more solemn posture, the humble reality of this woman who, although she was very sick, prostrated herself with the help of two sisters before the silver ciborium containing the Eucharist (cf. LegCl 21), which she had placed in front of the refectory door that the Emperor’s troops were about to storm. Clare lived on that pure Bread which, according to the custom of the time, she could receive only seven times a year. On her sickbed she embroidered corporals and sent them to the poor churches in the Spoleto valley. In reality Clare’s whole life was a eucharist because, like Francis, from her cloister she raised up a continual “thanksgiving” to God in her prayer, praise, supplication, intercession, weeping, offering and sacrifice. She accepted everything and offered it to the Father in union with the infinite “thanks” of the only-begotten Son, the Child, the Crucified, the risen One, who lives at the right hand of the Father. In the fall of 2012, as it happens, we visited Assisi. The room where St. Clare died – the far corner, in fact. Photographs are not allowed in the chapel – the site where Francis discerned the voice of Christ. The “San Damiano” cross that is in the chapel at San Damiano is a reproduction – the original is in the church of S. Chiara, back up in Assisi. 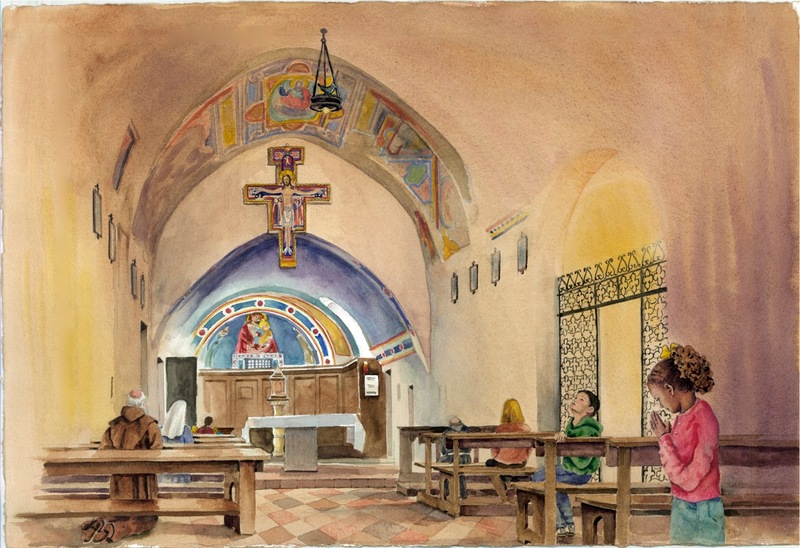 And….part of the fruit is Adventures in Assisi…so even if you can’t have a photo of the cross inside S. Chiara, you can have a gorgeous watercolor.. Tomorrow (August 4), Pope Francis will visit Umbria, with the particular destination of the Porziuncola (or Portiuncula), a small chapel standing within a huge church, Santa Maria degli Angeli, which in turns stands at the base of the hill on which Assisi is built. Having prayed and meditated and discovered his vocation here in 1209, St. Francis founded the Friars Minor and eventually obtained the chapel from the Benedictines as a gift to be the center of his new Order. Here, on March 28, 1211, Clare, the daughter of one Favarone di Offreduccio received the habit of the Poor Clares from Francis, thus instituting that Order. And now we come to 1216 when St.Francis, in a vision, obtained what is know as the Pardon of Assisi or Indulgence of the Porziuncola (also written Portiuncula), approved by Pope Honorius III. This special day runs from Vespers on August 1 to sundown of August 2. According to the official Porziuncola website, one night in 1216 Francis was immersed in prayer when suddenly the chapel was filled with a powerful light, and he saw Christ and His Holy Mother above the altar, surrounded by a multitude of angels. Francis gathered his brother Franciscans here every year in a general chapter to discuss the Rule of the Order, to be renewed in their work and to awaken in themselves a new fervor in bringing the Gospel to the world. It is also the site of St. Francis’ death. ” He was at that time dwelling in the palace of the Bishop of Assisi, and therefore he asked the brethren to carry him with all speed to the “place” of St. Maria de Portiuncula, for he wished to give back his soul to God there, where (as has been said) he first knew the way of the truth perfectly…. …Then, for that he was about to become dust and ashes, he bade that he should be laid on sackcloth and sprinkled with ashes. All the brethren (whose father and leader he was) came together, and, as they stood reverently by and awaited his blessed departure and happy consummation, his most holy soul was released from the flesh and absorbed into the abyss of light, and his body fell asleep in the Lord. But one of his brethren and disciples, a man of no small fame, whose name I think it right to suppress now because while he lives in the flesh he chooses not to glory in such an announcement, saw the soul of the most holy father ascending over many waters in a straight course to heaven, and his soul was as it were a star having in some sort the bigness of the moon and possessing somewhat of the brightness of the sun, and borne up by a little white cloud. It is also the spot where, according to her Spiritual Autobiography, Simone Weil prayed for the first time. From John Paul II’s letter on the occasion of the re-opening of the Porziuncola after the 1996 earthquake. The Porziuncola plays a part, naturally, in Adventures in Assisi. It provides a climax of sorts, in the story in which the two children have walked in the footsteps of St. Francis, both literally and spiritually, having learned some lessons about humility and poverty of spirit. Ann found it a challenge to do a painting in which the scale of the small chapel in the huge basilica was evident, but still include the children. But I think she did a great job! Remember, if you would like to order this book from me – you can go here. Perhaps it would be a good gift for you local Catholic classroom?? As we approach the end of the school year, perhaps you’d consider gifting teachers, catechists, DRE’s, classrooms and parish libraries with some of my books?? Well, if it’s a female teacher or catechist – The Catholic Woman’s Book of Days. Please note – most Catholic women’s devotionals out there are explicitly for “moms.” That’s great, but guess what – not all Catholic women are mothers. My devotional doesn’t assume anything about the woman using it. For the fact is, not all Catholic women or moms nor is mom-hood necessarily the controlling paradigm of every mom’s prayer life. Several years ago, in my work for Living Faith, I received a gentle corrective from my editor. Most of my entries for that quarter had been kid-centered, she said, and she just wanted to remind me that the devotional had a more general appeal beyond those with children. I’ve always remembered that, and especially when pulling this book together. So consider that! I have a few copies here for sale, but you can find it at any Catholic bookseller or online. Whether you’re talking about a parish school, school or religion or library…consider gifting them with one of the books of saints or one of the picture books. If you would like to gift a youth minister or teacher of preteens or teens…consider a Prove It! Book. I’d suggest Prove It! Prayer or, for a young woman, The Catholic Woman’s Book of Days. Prayer of St. Francis? No. The incorrect association of “Make me an instrument of your peace” with St. Francis runs so deeply now, no, it’s not surprising to see a bishop mention it or even it presented that way on the USCCB website, but still. It shouldn’t be this way. Truth matters, in areas great and small. I explored the matter in my book The Words We Pray. There are a couple of pages available for perusing online. I think the actual history of the prayer makes it even more interesting than it is as a mythical pronouncement of St. Francis. Also, when Make me a channel of your peace comes to define the saint, we miss out on even more challenging words. Try it. Read his letters and Rule. If you want to learn more about St. Francis of Assisi, I recommend this biography by Fr. Augustine Thompson, OP. And for kids? My Adventures in Assisi takes kids on a journey with the saint on the roads of his home town. More, related, from an old post: Who didn’t write what.